I love my little Regal bread machine. It's such a time-saver. I especially like using the dough setting. To make a loaf of bread just remove the dough from the machine, plop it in a loaf pan, let it rise about 30 minutes, then bake. So easy! Here's a few bread machine tips I've learned along the way. 1. Always add your ingredients to the machine in the order shown in the owner's manual. Usually liquids are first, followed by the dry ingredients, with the yeast going in last. You want to keep the yeast away from the liquids until the kneading cycle begins. 2. Ingredients should be at room temperature. I measure my milk and butter ahead of time letting it sit on the counter for 30 minutes. This warms things up a bit and gives the butter time to soften. 3. Salt is necessary when making yeast bread because it controls the growth of the yeast. Salt also aids in the rising of the dough so always include the salt. 4. Make clean-up easy by spraying the kneading paddle with a nonstick spray coating before adding the ingredients. 5. Always remove the hot bread from the machine as soon as it is done, placing it on a wire rack to cool. 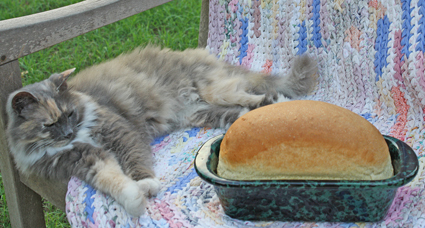 If you leave the loaf in the machine, the outside may become damp and soggy.